I was hesitating whether I should write about this (besides my personal combination of busy/lazy) for a couple of days, because the Arctic is such an amazing place that it's easy to get carried away. When you see something for the first time, it's tempting to go: "Oh my Gawd, that haz got to be the first time!" That happens to me a lot, especially during winter. It's only logical as we are seeing a lot of things for the first time, or for the first time since a very long time. But there still remains a very fine line between 'unique' and 'unusual, but not unique'. A line that can sometimes be difficult to tread. For instance last year at the start of February I wrote about the spectacular lack of ice in the Kara and Barentsz Seas, notably around Novaya Zemlya. I had a hunch that this was pretty much unprecedented during the satellite era and said as much in a guest post for Climate Progress. I was mildly criticized for it by the NSIDC's Walt Meier via Climate Central (and I will never forgive him for it ;-) ). Now the hunch turned out to be reasonably correct - although there had been a similar retreat of ice at a later date in 2011, caused by wind patterns - but I didn't invest the time to make sure it was. This year things are calm in the Kara and Barentsz Seas. At the surface that is, with not even a breeze towards the coast to show how strong or weak the ice is. But as usual, when it's calm on one side of the Arctic, something is going on on the other side. Some commenters have been keeping a sharp eye on this, and I think it now merits a blog post of its own, if only because of the possible implications this event might have for the ice pack once the melting season gets underway. And it's big time spectacular. 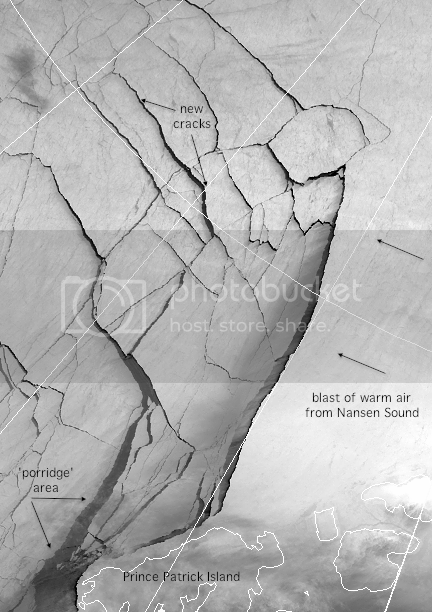 Last week, on February 22nd commenter A-Team - who has really been animating the blog lately, figuratively and literally speaking - made the animation you see on top of the post, showing massive cracking in the Beaufort Sea. In the following days fellow commenter Jim Hunt picked up on that and wrote a blog post on his Econnexus blog called Arctic Sea Ice is Cracking Under the Strain with a spectacular image of the ice pack in the Beaufort Sea on February 27th. According to A-Team: "If taken as a simplistic predictor of the 2013 melt season, we are 51 days ahead of last season." Chris Reynolds weighed in: "I've done some digging around regards this long fracture/lead in Beaufort. Nothing as big has occurred since 1999 in QuikScat or Ascat, the weather doesn't seem that abnormal, so I think it's probably mainly due to abnormally thin sea ice." Also see his blog post with further analysis. That's the story so far. What we have here, definitely isn't a failure to communicate. I take my hat and wig off to all the commenters and bloggers who pulled this info together, as much in real-time as the satellites will allow. According to the ECMWF weather forecast model this high is going to remain pretty intense in the coming week at the least, with sea level pressures of up to 1055 hPa, so we can expect further cracking and transport of ice (some of it multi-year ice) towards Bering Strait. Which brings me to the second reason behind this event, already mentioned by Chris Reynolds: the ice is weak, it's thin. How do we know it's thin? Because of last year. Last year I thought that the ice in the Beaufort Sea had thickened up a bit because of low temperatures throughout most of winter (while all the action was in the Kara-Barentsz region) and that it would probably withstand the onslaught of sun and wind better than the Atlantic sector of the Arctic. To my surprise, and that of Walt Meier among others, the ice in the Beaufort Sea was decimated at great speed. The fact that the ice lets itself be pulled so willingly into the Beaufort Gyre so early in the year, with the start of the melting season still some 4 weeks off, is a sure sign that it's thin. This, of course, is a very bad prelude to the melting season, even if there are a couple of weeks left for the ice to thicken. Those huge cracks will freeze over, but the ice will be very brittle and the first to go, probably creating open spaces between multi-year ice floes where the Sun will shine and quickly heat things up. Unless the cloud cavalry comes to the rescue. Like A-team says: "Beginning of the end, end of the beginning, or just a bad hair day for the ice pack -- we'll have to wait and see." The one good thing about that big high pressure system is that it makes for clear skies, which means very cold conditions at the surface. As blogger Diablobanquisa reported earlier today: -51ºC today at Eureka, Ellesmere island (link). Maybe the ice in the central Arctic and Canadian Archipelago can thicken up some more. It is also pushing ice towards the Atlantic where up till now there has been a lot of open water. This could very well cause another relatively late and high sea ice maximum, which will no doubt be used as disinformation in some quarters. Even AARI is showing those big cracks. 4 weeks ago wayne explained (January 24 in Open thread #1), that those large cracks observed back then were tidal events - and since full moon was at 25th Feb. - maybe it is again something very normal. But the pictures are much better this time. Interesting times. One thing is certain. This year commenters, satellites and bloggers have not stopped their observations even for a second. Remarkable. Thank you for the good work Neven. It is tidal in part SATire , it is also in addition the gyre current, the pressure gradient and winds from the Anticyclone hovering above, all in near perfect synergy combined along with much thinner ice. Of great note exemplified by ice buoy 48731 in the same sector, on the thinner ice, usually consistently 10 degrees C warmer to buoys near the Canadian Archipelago coast. Similar to these openings were seen every year, but this winter far more prominent numerous and common. Will post other Arctic Ocean areas which are equally weird, its strange everywhere. After an hour mucking around with Google Earth, and learning that you have to use photo overlay to do polar imagery, and discovering unless you know altitude and exact lat/long of each corner of the AVHRR image you want to overlay on GE - it is frustrating. Nothing ever matched without those needed points. Good luck. It may be influenced by lunar forces, however the fracturing took place throughout the lunar cycle and only accelerated again on the 25-28th. The other forces, wind and current continue to impact the ice, including MYI ice. I am posting an updated image on the Forum to show fractures through the night, which now tie in to those that radiate from the Fram Strait. "Has anyone alerted Steven Goddard? ;-)"
It's not tidal, not at all! The cracks have now reached Prince Patricks Irland. The question is when did the melting season start this season (2013), as I recall it, it started early February, where heavy cracks in the sea ice were seen north and north east of Greenland, later A-Team noticed "some" thing around Barrow which developed into what we have today, this may not be seen as part of melting, but it will definitely accelerate the "official" melting season later on, the Perimeter factor or the increased melting surface will probably add to a new extend and area low this season, I also believe this season will be a game-changer, and my prediction of no sea ice at one point during the summer season of 2016, seems now very conservative. Just to add some meat to my claim that it' not tidal. Here's what I posted over at the forum. This shows that the Beaufort event was part of a large scale movement of the ice. The event starts after day 50, 19/2/13. When I used to follow QuikScat such events were relatively common, often associated with a shift from high to low index AO. However that doesn't apply here, the AO has been negative throughout this period. It is worth noting that as we were all concentrating on Beaufort there was significant coastal lead opening off the Siberian coast, and that the advance of ice in the Atlantic sector is due to net clockwise movement of the bulk of the pack. Now weather data, SLP and GPH for 500mb from Wetterzentrale. This shows that after 19/2/13 a high pressure ridge develops trapped between two lows, creating parallel dipole features forcing a net clockwise movement on the winds over the ice. I'm still unable to justify why there might be a tail to sea ice, i.e. not a sharp crash to zero, in terms of heat loss in autumn or sea ice thickness/growth feedback. Both are active in the present climate and neither is managing to stem the volume loss. However we still have to see what happens in the tortoise and hare race between declining insolation at the end of the season near the north pole, and earlier melt. That factor might just give us a small tail. But I agree that this year looks like it will be a major crash. I had got my eyes on the early June CT Area anomaly crash as the first main indicator. Now I expect that to be far more massive than last year, the previous sharpest drop. Yes we also see several places of open sea in and around Siberian Coast, it is like the whole "Arctic Pizza" is on the move! Hmmm, I joined this blog thinking of a long winter snooze, followed by a summer of watching paint dry (melt season). In rapid response situations, such as the Great Cyclone of 2012 or now Crackageddon, the hive mind here notably outperforms scientific journals (aka event obituary repositories). Just as bees share nectar locations but don't all fly to the same flower, self-correcting independent thinking here on the blog can run circles too around the all-assimilating Borg. Some clouds are circling, the last clear shot is is the 13:17 Ellesworth: 1850 x 1560 pixels 1.19 km on a side with a projection nadir at 84º N 140º W, challenging A4R and myself in marshalling geospatial resources into a common projection and scale to facillitate allow our channel overlays. I barely use Image processing professionally but learned it years ago voluntering for the Nature Conservancy -- the statewide archive was on campus and Western Aeronautics down the street. They had 51 preserves with 30 aerial photos each going back to the 1930's. Antique lenses, oblique shots at dawn, low-flying planes, stereo NHAP color infrared, you name it. Then Photoshop went to bloatware at v2.5 and TNC HQ went to vector GIS. The last 24 hours have seen moderate movement eastward into even older thicker ice and shore breakage along almost all of Banks' neighbor Prince Patrick. (There's a fine Canadian islands map: google 'canadian islands mcr_0036'.) The front line, conveniently falling along the 140º W meridian, seems stalled though widening and sub-cracking continues behind it. The Navy animation, which goes out to 07 Mar, is predicting continuing clockwise rotation. Just stumbled upon this article. Which details poor ice state in Beaufort in December 2007, satellite image on that page. That isn't visible on the QuikScat images I've used, ftp here. So the cracking before and after the arc cracking event, cracking that isn't visible on ASCAT, probably does have precedence, even if earlier in the winter. The ice has lost a lot of volume since 2008 winter, although to be fair thickening from December to end February is substantial. However the arc cracking event after 20/2/13 doesn't have precedence during winter in the QuikScat/ASCAT record, as far as I can see. There is a lot of literature on sea ice fracturing, e.g. here is a very interesting paper in the context of the current discussion. Once again, for me the really abnormal event has been the arc fracturing event, which I don't recall seeing in winter. Yes, that event in 2007 looks very similar, although at a different stage in melt / freezing season, and I must admit it looks much more fractured than this year. Unintended consequence of the forum. Same discussion in two places. Confusing?? Bear in mind the difference in thickness, e.g. The thinner ice in December makes fracturing mechanically easier. Yep, confused? You will be! Slightly confusing perhaps, Dr Tskoul, but as long as people don't react on the forum to what is written here, and vice versa, it should be fine. Interesting that CBC article from 2008. Maybe I should bother Dr Barber and ask him what he thinks of this event. And don't forget, this is not over yet. The weather forecast still has a week of strong anti-cyclonic winds. It is perhaps the main reason I decided to write about it. Yes I had the thinner ice in December in mind. But I am pretty sure the major crack in the ice above CAA will be from about Ayles Ice Shelf towards west, the fissure is getting more and more clear by the hour. According to the BBC's Andrew Neil in a presentation in the City of London on Thursday, "Windmills" are far too variable and the Good 'ol US of A will soon be pumping oil and gas to the Gulf for export, whilst the Poor 'ol Arctic Ice Cap melts quicker than ever, swiftly followed by Greenland. For some strange reason Andrew neglected to mention that last bit though. P.S. Thanks for the mention. Chris, tides have always had a huge influence. Everything concerning sea ice is about all forces that affect it, not just one, at times and with right conditions a single force vector may influence more than others. There are many factors affecting sea ice on most occasions, but particularly in this case where they are all in synergy. Ice Momentum, sea current, surface winds, tidal waves. Other great influences are air temperatures and ice age affect displacement speeds, air pressure (like the same air pressure giving hurricane surges) create new openings with in turn affect motion. Denying one of these factors is creating a not complete model. The above is from cryosphere todays comparison tool. Is the feature for 25/02/2013 map, the line in the Beaufort Sea the same thing that you are talking about here? Or is the scale on this map too small? It starts to appear around 22/02 and disappears around 01/03. I have an unrelated question as well. Do you know the (approximate) data when the Barentz Sea should reach it's maximum extent? Actually you can see that feature appear and disappear again on the animation above. If we're talking about the more typical fracturing in the pack, or especially coastal flaw leads, then yes I agree there's probably an effect from tidal forces. However the arc fracturing that I'm claiming to be unusual opens up at the same time as a high pressure / low pressure configuration drives a clockwise wind forcing on the pack, and the entire ice pack in the Arctic Ocean moves clockwise. Therefore this event is wind driven. And once again, in the paper I linked to above it is stated that wind forcing is the dominant driver of pack movement. I say 'once again' because it's such a common claim in the literature. scientific journals (aka event obituary repositories). self-correcting independent thinking here ... can run circles too around the all-assimilating Borg. And who are the Borg? The scientists? Those who are charged with providing defendable evidence based observation and theory? The purpose of this blog may be diametrically opposed to that of WUWT, but sometimes the comments are disturbingly similar. You anonymous coward! I will ban you and delete every trace of you on this blog! How are the cracks doing? This may have already been pointed out but it looks like that in past years the multiyear ice extended into the Beaufort Sea while this year it doesn't. Unfortunately this record only goes back to Feb 2011. Do you know if Beaufort has lacked multiyear ice in the past? File this one under Arctic meteorological curiosities -- a very visible blast of warm air pouring out westward onto the oldest, coldest ice from the Nansen Sound (which separates Axel Heiberg from Ellesmere). The Beaufort crack area (not shown again here) is much darker (warmer) than the old thick ice, right up to the crack boundary. After a big crack, much warmer water, perhaps newly refrozen, also show up for several days as a downwind wafting thermal infrared effect. The event here began at 08:17 UTC on 02 Mar 2013 and runs to 11:26 the next day (and counting), so 27 hours and change. On this 10.8µ thermal infrared AVHRR imagery, the scale provided in the last frames runs from -51.3º to -28.8º C.
Model based, but easier to read: Drift Age Model. These sets of images show conditions in Beaufort to be exceptional in the long term, as far as I've seen. No - scrub that conditions are exceptional. the hive mind here notably outperforms scientific journals scientific journals (aka event obituary repositories). self-correcting independent thinking here ... can run circles too around the all-assimilating Borg. I too felt uncomfortable with that statement. I don't like the science bashing that sometimes goes on here. Especially the regular attacks on the modellers. We are amateurs, and we shouldn't forget it. As amateurs we don't have reputations at stake if we make public pronouncements that are later shown wrong by events. Nevin asks, how are your cracks doing today? Fine, thanks. There are new sharp panoramas provided at these links (Beaufort, Ellesmere). If you make a blink comparator, the cracking can be seen still going on in the Espen's porridge area (Prince Patrick) and internally farther north, but there's been no further eastward transgressions into the CAA ice, nor any further clockwise gyre movement. So, given the weather and the Hycom forecast, let's see wait happens over the next few days. I estimate the total crack length (eg, future additional melt perimeter) from this event at 80,000 km. For that, I multiplied the number of lat/long sectors affected, the number of many cracks I could lay out NS along a full 5º of latitude in a sector (555 km), and two perimeter edges to a crack. Is 80,000 km a lot or a little, does it mean less or more because of its early date, for this year's ice condition, for this year's melt season onset, and how significant to the Sept 2013 minimum are structural weakness and perimeter anyway? I don't see where the 'control' of past years is going to come from. There's not going to be a year where every condition is more or less the same except for total crack length on 03 Mar. So this is not a situation where the effect of a single variable can be isolated. In terms of the denial community, I think the Sept 2013 minimum will speak for itself (and trump, either way, anything we say about February cracks). The real issue is drastic change to planetary heat budget and heat distribution from open water in the Arctic during prime insolation. Ice volume, ice extent, albedo measure steps along the trail. And we've already gone down that pathway quite a long ways already. I contacted Dr David Barber, and he says that though this event is early for the time of year, it remains to be seen what the impact will be. Also depending on the weather, of course. That said I don't think it would happen without a high/low system positioned to drive water out/in through Fram /Bering straits respectively, or possibly both. So my guess would be a large body of water was driven out of Fram [possibly twice a day for a week or so] inducing a flow in from the pacific. The pacific water would be fresher thus lighter and although the first flush would be from under the ice in the strait the rest would previously been south of 60degN and thus have a kinetic speed due to the earths rotation of 519miles per hour whatever its apparent motion, at 75degN it 's speed would be 268miles per hour and thus it would be writhing with an excess of kinetic energy of 100+ meters per second. To be energetically "comfortable" this/these bodies of water would "want" to flow east and be as far from the axis of rotation as possible, that is south or surface. They would be induced to flow to replenish the waters lost through Fram, and would set off like a slowmo bolt of lightning, the current heading north, but with a rotational [clockwise] energy in each wave perpendicular to the flow [like magnetism when a current flows in cable]. So like a huge log rolling beneath a wave and heading east due to its rotational momentum, but since its heading north picking up more potential energy on the way. To expand the electrical analogy I think a cross section though the flow would show it surrounded by smaller induced contraflow vortices wrapped around it like armoured cable, but I can't 'get' which way these are wrapped or their number, but 7 +, and these act like small centrifuges concentrating the heat at the top, and the salt downwards, and I think carry potential energy in the opposite direction to the main current and that this interacts with the main flow. I'm pretty sure this vortice thing goes on down at least a further level too and that the electicity/magnetism analogy holds at every level. As these waves rotate clockise+ eastwards at the surface [well as close as they can] any impediment such as thicker ice will potentially halt their progress, the potential energy then erodes the ice and gets dissipated north /south until a breakthough/backup occurs/arrives when the surface is broken or it dives under the ice and proceeds. Of course beneath this the circumpolar current of atlantic waters continue to flow with their wave systems not aligned to the surface waves but still shedding heat upwards as they in their turn begin to head north again as they approach the Canadian archipelago. This fresher water would then likely end up flowing through to Baffin. Thats a game changer. Anyway that's my amatuer guess, typical action of EKE but writ large. I think it's worth watching the CAA coast poleward of the furthest fracture. (And this is partly for lurkers) You can see the two fractures that opened up the other day on MODIS band 367 (see note at end of this comment). This false colour reveals water vapour venting from the fractures. They're in the top right corner. It also makes spotting the land easier. If you follow down from the lowest (most poleward) fracture you can trace a slight line along the coast. This is a coastal flaw lead and isn't significant, tides make these appear all the time. Whatever activity there is there is not significant at present. Selecting 250m per pixcel (large images) and the plumes from the new fractures can be seen beautifully. Scrolling below these reveals that the coastal leads are a cluster of small parallel cracks of the order of 250m across of disturbed ice. The lack of moisture plumes shows they're not open water. Unfortunately the black mask of continual darkness over the pole limits examination. However from what is visible there is absolutely no indication of further cracks running out from the coast into the pack. I use MODIS in preference to IR satellite for this sort of job because of its higher resolution. 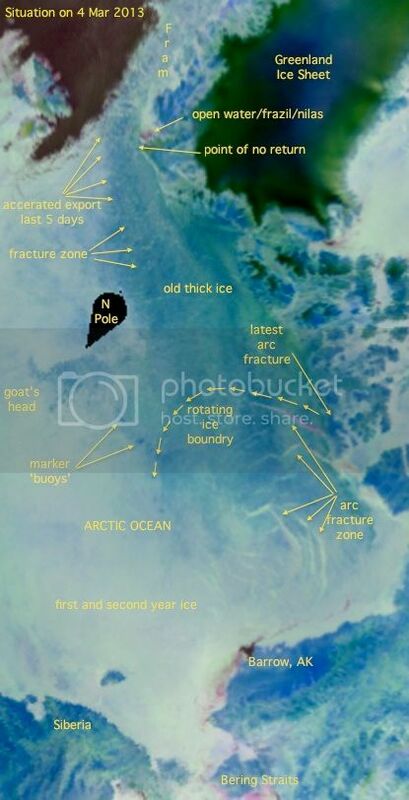 This shows that whilst there is no evidence of fracturing continuing within the MYI pack, there is fracturing occurring further up within the Arctic ocean. These curve down from the top of the main fractured area in Beaufort towards the north coast of Greenland. This is significant because I've just checked ASCAT, which is the best way of judging bulk pack movement. The latest two ASCAT images have been updated in the last hour or two and they show that the net clockwise movement of the pack that caused the Beaufort break up is continuing up to yesterday 2 March. Which is to be expected given the high pressure Neven shows in his comment above - high pressures rotate clockwise in the northern hemisphere. *The source of these images can be found be googling 'MODIS Arctic mosaic'. If I were to post a link it would take you back to the same date every time. My published scientific work is cited by another scientist in another peer-reviewed journal on average once a day. Some 3,615 times in the last ten years. So yes, I can offer some perspective on climate science and the 2100 warning -- it's the biggest prediction blunder in the history of science. 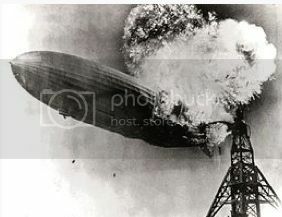 Right in there with the pronouncements of the Hindenburg blimp safety commmittee. If it's tidal then how come the mass movement of the pack starts as the high pressure moves in? See my post March 2nd 9:38. And how come the various papers I have on fracturing events all cite wind as the cause of the past fracture events studied in those papers? e.g. See the paper ref'd in my post March 2nd 17:36. I didn't realise, although now I dimly recall that you have said before you work in science. I still didn't like that comment, but I have to agree it's looking like the biggest scientific prediction blunder in history. So perhaps I should agree more with you. Thanks for contacting Dr Barber. You'll see on my blog what my thoughts are about the dominating issue this year. Also to let you guys know - will post about it in a couple of weeks from now - I have updated the sea ice concentration maps on the Arctic Sea Ice Graphs website for the whole melting season, which should make it easier to quickly check and compare this year's ice pack to that of previous years (except 2005 which I removed). ECMWF maintains that this is going to continue for at least 5 more days, perhaps slightly less intense than now. That high is pulling in warmer air from Alaska. That should show up soon on DMI's 80N temp graph. Melting in Okhotsk starts 4 weeks from now. Same here. I'll be writing about this some time soon. I've decided to be a bit more blunt wrt the IPCC/scientists, if only as a counterweight to fake skeptic pressures. Yeah, I just noticed that low. I keep looking for why the sea ice area is expanding and whether I can tie in the changes in CT's main area index with the regional changes on their graphs. I tried it last year in July and even then with a strong rate of decline the numbers just didn't seem to tally. Anyway, the increase in Bering also seems to be due to wind, a low pressure sitting over the area. With the increase in the Atlantic sector (mainly Barents) being due to ice being flushed into that sector by the bulk movement of the pack. Wetterzentrale - is that what we're all calling ECWMF? However this IR from Env Canada shows no low, but cloud in a swirl over the Siberian coast. With WetterZentrale showing a local minimum in pressure and low in GPH that matches the location of the cloud in IR. So I'm throwing that Univ of Koeln link - it's just not reliable. We're lucky all this is happening under a high. Wetterzentrale is the website with forecasts by several models (with a good German forum on Arctic sea ice, Arcticio posts there). I believe fsavnnh is GFS, and fsecmeur is ECMWF. wow johnm33 -- mighty fine post there. Keep it coming -- we could use more physical oceanography around here. EKE, that would be eddy kinetic energy. neven, on 17 Sep 12 you were "ready to p*ss" on these climate models. I wondered at the time if this was being overly chivalrous. However I don't know how much good it would do to dump on them. Indeed, I see a lot of defensive and over-cautious commentary both on the blog and in press releases accompanying journal article releases -- exactly the intent of the denial industry. I'm more forward-looking when it comes to Arctic sea ice -- like the man said, history is bunk. Nothing is going to change until we get a really really drastic development. We're not Iroquis looking out 7 generations on every decision. 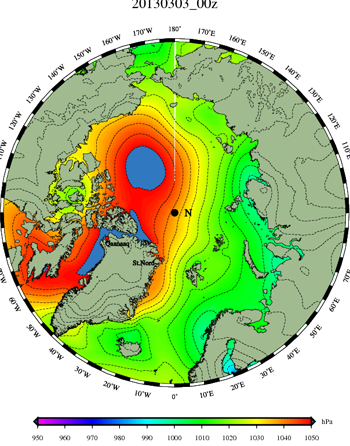 1) In the summer, an intense LOW PRESSURE system (aka The Great Arctic Cycle of 2012) moving across the ice can now churn it up MORE READILY, potentially causing increased melting, mixing of warmer water from below, etc. 2) In the winter, an intense HIGH PRESSURE system can now cause large cracks in the ice MORE READILY, potentially opening the ice up to early and more rapid melting once the melt season begins. Again, both of these are related to the exceptionally rapid decline we've seen in thickness of the ice, and both would be seen a positive feedbacks to that decline, though they occur at opposite times in the seasonal ice cycle. R. Gates, I thought about you last night (no, not that way). How did that SSW play out? Is this big high the polar vortex's final spasm? It's still pretty cold out there. Chris I meant that the cracks were formed as a consequence of tidal forces, and that once opened they would set the ice free to rotate [especially where the cracks ran lattitudinally] Without the cracks I would expect the thin ice to be in the wind shadow of the thicker ice and for localised turbulence to largely prevent the wind gaining purchase. Although with such an extensive high no doubt some smaller cracks and compression would occur, but if nothing was going on below I'd expect the openings to be short lived, in current conditions. A-Team wow right back at you for all the stuff you do, and thanks. I'm still highly sceptical. For some time I've seen people talking about tidal forces and the only role I've seen has been in coastal flaw lead behaviour. Sorry, should have added, the high pressure forcing the bulk movement of the pack has sustained that movement from 20/2/13 to 3/3/13, so far 12 days. "Without the cracks I would expect the thin ice to be in the wind shadow of the thicker ice and for localised turbulence to largely prevent the wind gaining purchase." A-Team, denialist activities aside, it's a rare climate scientist who's willing to make any sort of firm prediction that could affect their career or reputation. "Likely by 2030-2050" is so very safe. But if Maslowski turns out to be correct and the summer ice persists in that behavior, by the end of this decade the GCM teams will really have to be scrambling for any credibility when it comes to the Arctic. To amplify my last point slightly, IMO (IANAS) the models are getting stuff like this wrong because they're not correctly reflecting the most fundamental changes to the ocean-atmosphere circulation, starting with but not limited to expansion of the tropics. They do capture the effect (it's inescapable physics after all) but nothing like so soon and as fast as observations show. Add polar amplification to that (mainly Arctic, but let's not forget the changes to the Antarctic Circumpolar Current and the associated winds) and we have a recipe for disaster that the models seem only able to cope with to the extent allowed by constant after-the-fact patching. One unfortunate symptom of the problem we can look forward to seeing later this year is the AR5 WG1 report, which because of its lowest-common-denominator drafting process is guaranteed to be a virtual dead letter when it comes to these issues. OTOH it is encouraging that more and more scientists are seeing the problem and publicly turning toward activism. So can we now now modify Planck's dictum to say that climate science is progressing one model failure at a time? But the models and modelers are the ones we have, and our only hope of eventually being able to predict the future course of the climate, albeit probably when it's too late to stop some of the worst impacts ("but you said you were uncertain!"). Regarding this year's SSW event. It was a classic SSW in many respects. Its roots began as vertically directed warm pulse in the troposphere in mid to late December over Asia. That pulse traveled rapidly northward at very high stratospheric levels (above 10 hPa) and then descended over the Arctic to cause the SSW event about January 6th or so. This SSW event of course fractured the Arctic vortex and it(along with associated higher pressure) of the SSW continued to dominate the Arctic stratosphere for most of January. What is most interesting about the vortex this year, is that prior to the SSW event, the vortex was strong from the mesosphere all the way down to the lower stratosphere at about 300-400 hPa. After the SSW event fractured the vortex, even though it reformed in early February, it never did reach down as close to the surface, only coming to about 70 hPa. As I said, the vortex has now peaked around Feb. 20th, and will likely fade entirely for the spring/summer NH season by April 10th or so. One more comment: You said: "Is this big high the polar vortex's final spasm?" In this chart we clearly see the higher pressure that dominates some of the NH surface, and then as we go up to higher layers of atmosphere, we pass through a lower pressure area and then a higher pressure area that is a residual of the SSW event in January until we finally come to the lower pressure region of the upper levels of the stratosphere that typifies the Arctic vortex that began reforming after it was fractured by the SSW event. "...The current surface high pressure system is not associated with the lower pressure of the vortex, which currently resides many thousands of km higher up in the atmosphere." "Many thousands of meters," surely? a huge sound ensues, a mega lead is being made, capable of being detected by sensitive seismological equipment. It is a good thing to discuss this here, to learn from others and to elevate our understanding of sea ice. Dear clueless ones ... the Borg represents American cultural hegemony, forced globalization, ethnic assimilation -- stop speaking spanish at home, have a chicken mcnugget instead of that punjab choley, here's your visa card. The Borg sees it differently of course: a melting pot pulling together the best these cultures have attained into a single master empire. While that may have some attractions if not coerced, as noted above, I find it a less effective way to do science than collective individualism (here, Neven herding cats). My favorite part in Star Trek comes when the ship's engineer Scotty says, "Cap'n, the engines ... they are gonna blow ... I cannae hold them to warp speed any longer " but Kirk (capitalism) takes the big risk and refuses to give the order to shut down. Or as Scottie might say today, "Cap'n, the multi-year ice ... she's starting to blow ... I cannae hold her to the CAA any longer." This draws out the clockwise rotation rate and so the angular momentum that must be furnished by torque and conserved (modulo bummock damping) in our various hypotheses about what makes the ice move. We need to get a handle on future CAA tipping conditions (if any): how long will the ice still be held against the shore and what will be keeping it there? I don't like the science bashing that sometimes goes on here. Especially the regular attacks on the modellers. I should get to see Prof. Julia Slingo, (Chief Scientist, Met Office) this week. I won't tell her that I trust you more than the Met Office modellers. I do - and that also goes for others on this blog. You obviously have the background to cope with your wide ranging reading and are in a position to give your judgements without pulling your punches. It would be impolite to tell Professor Slingo how this contrasts with her Met Office modellers, who may understandably be held back by reputational reticence. But should I say anything at all? Should I ask her why the models seem so wrong about Arctic sea ice? "What year do you expect arctic ice volume to dip below 500 km3?". Assume that answers could be given anonymously. Is there any sort of scientific consensus on this question, or would the answers be all over the map? Also, for those who guess much more than 5 years, what sort of negative feedbacks do you think they would cite as the most important? My guess is that on this blog the median answer would be somewhere around 2016. I have no idea what the scientific guess would be. "Many thousands of meters," surely?" Surely, 15 to 20 thousand meters, but not thousands of km as I so foolishly stated. Thank you for the correction. The "Arctic Sea Ice Forum Distributed Sea Ice Model" in case you were wondering. Perhaps Julia would also be interested in a long conversation with "the Bob Geldof for climate change"? Seems as though she already is! "Surely, 15 to 20 thousand meters, but not thousands of km as I so foolishly stated." Not 'foolishly', IMO; these slips happen to most of us (certainly to me.) In blogworld, editing tends to become a public affair... But you're welcome, and thank you in turn for the correct numbers. And now Petoukhov et al. 2013 is out! "Quasiresonant amplification of planetary waves and recent Northern Hemisphere weather extremes"
Why is it "off topic" Alex? Hits the nail on the head as far as I can see! 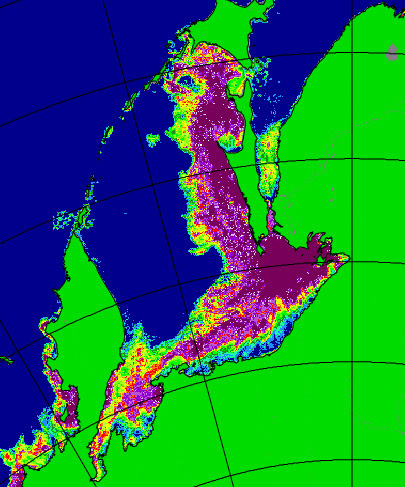 It seems that the MYI is still fracturing north of Ellesmere and Greenland. I posted a highlighted image of fractures that have developed in the last day on the forum. I anticipate that as long as the ice is moving, more fractures are likely to develop in the remaining MYI area. And the ECMWF forecast hasn't changed much. The high stays in place, with SLP of 1030-1050 hPa, for another 5-7 days, after which it gets pushed out by that enormous low over the Okhotsk Sea. The OSU Polar Met Group has the high remaining in place through Thursday at at least 1040 mb, and strong winds remaining in a similar pattern. I looked today at daily sea ice using a different pair of high frequency radar goggles, namely the JAXA-ISIJ 89 Ghz polarization imagery. For Mie scattering considerations, that wavelength is 0.3368 cm or 3368 microns. The photos are quite bizarre, with swaths that clearly aren't properties of the ice per se. However the resolution is twice as good as the 36 Ghz imagery. One very useful thing I found in their archives was a satellite misfunction on 23 Jan 13 -- only a fractional swath. 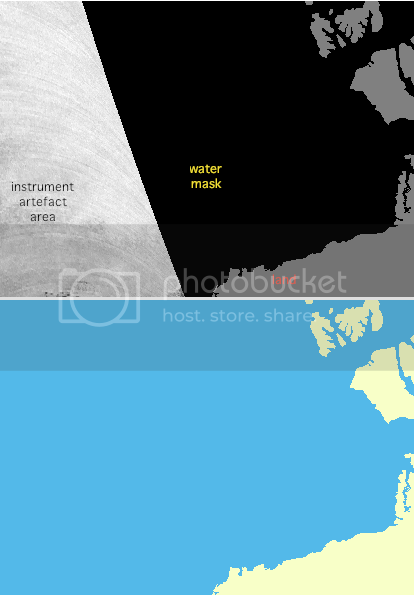 That's a throwaway but for the fact that it quickly provides a very high precision mask of waters of the whole Arctic region. I believe the mask was made from the radar returns themselves earlier in the project, rather than put in by hand (the complexities of the channels would make this quite tedious). Below is a sampler from the overall mask. Since not everyone here has the same project boundaries, it is better to go the image link and define your own region (using the color picker, selection invert, and fill with foreground). I finally got around to making a database for the imagery products we discuss here, to be posted shortly. It tabulates all the rotations and rescales needed to get everything into the same scale and orientation. Then the information is geospatially co-registered (pixel-perfect, in the same stack) which allows both comparison and active mathematical interactions between layers (generating yet more layers), all as time series. The mask is the mission-critical layer in the stack because it permits optimization of image enhancement. That is, the images you download rarely make optimal use of color space. Optimizing (say for contrast) with respect to the whole square canvas takes in lots of unwanted land and areas of open water. Thus it won't be optimized with respect to the sea ice alone. For that, you need the mask to restict the process. The goal here is hands-free optimal automation of daily imagery additions -- that can't be done consistently if the land and open water pixels are changing a lot from day to day. Alex, or anyone else who can explain, I think I've been understanding Jennifer Francis on the warming arctic causing the slowing of the jet stream and the staying still of trapped areas of high or low pressure, causing weather extremes to persist longer than they used to. This PNAS paper on quasiresonant amplification – how should that change the way I think about this phenomenon? I cannot do the math. Lynn, what I understood from that paper is, that wave numbers 6-8 could be more stable now - quasi stationary, e.g. like a standing wave. Normaly, only waves with lower wave numbers 4 or 5 were considered to be stable. So the link could be, that blocking events Jennifer was also talking about could be more frequent now, since also high wave numbers are now stable. But I can not draw the link to the "strength" of the jet stream, other then "strength" could be an other word for "low wave number". To try to answer your question despite that: Maybe the paper explains, why a weaker jet stream does not help against blocking events anymore. You do get around don't you! With regards the possibility of a rapid transition to a seasonally sea ice free state. Which I presume is what's on your mind with regards model failures. Why do we want to know beforehand? Is it so we can do something about it? From my understanding there is now no attainable option to prevent the transition. Forces are in play that are outside our control. Notz & Marotzke ruled out self acceleration. However in the post 2007 environment I think the transition to FYI and the Arctic Dipole have taken us to the point where now we are firmly in the realm of self acceleration (SA). It didn't play a role in getting us here, CO2 emissions and the resultant AGW did that, but SA is active now. However for those who have doubts about NAME and PIOMAS and their aggressive volume losses, what is going on can still be viewed as a Rapid Ice Loss Event, one that may temper in the years to come. Some may even think a recovery is feasible. These are complex issues and it's technically possible that they're right. Personally I doubt it, but that's my opinion based on data and the science I've read. In the end my opinion counts for naught, the real process is what matters and my responsibility is to get my mind closer to reality, not into some daft pitch battle. With the denialists, aside from recreational sniping over at Youtube, my attitude is to leave the ongoing process to deal with their false doubts. With the scientists I have just come to the conclusion that if I'm correct then by 2020 it will be quite apparent that this is no typical RILE, but is a rapid transition. So whilst I have respect for those scientists, who's work I have read and thus realised they're beyond my meagre abilities, I have decided to take a similar line to the denialists. But this is not driven by utter disdain, but by pragmatism. Within a few years the Arctic will give us the answer either way, and in that timespan there is nothing we can do about it. So whilst I welcome discussion with anyone, scientist or amateur, about the process in the Arctic. I don't see the need to batter anyone with my take on it because soon my understanding will be tested by the real world process. I've repeatedly said the Arctic is an intelligence test. Perhaps I should shift from the position. The Arctic is an experiment of awesome magnitude. When the results of the experiment are in, the intelligence test lies in our reaction to those results. PS, reading this evening reminded me of Maslowski. We're past his earliest date obtained by simple extrapolation. "To try to answer your question despite that: Maybe the paper explains, why a weaker jet stream does not help against blocking events anymore." My (mis? )understanding has been that a weaker jet stream – not spinning fast around the cold polar cap, powered by the difference between temperature/pressure in high and mid latitudes, but wobbling and wowing slowly between areas of lower contrast – is like a rubber band that's lost its elasticity and goes all floppy. So sometimes it gets stuck, not strong enough to push a system around the globe. I have always looked back at the Cryosphere today comparison graphs. These may not show leads but they do show when the ice is solid versus having flaws in its structure. Spring of 2006 is still in the lead for the amount of area in the arctic basin with less than 100% concentration. Just look down the page for the compare link on Cryosphere Today. Compare March 1 2006 with March 1 2013. 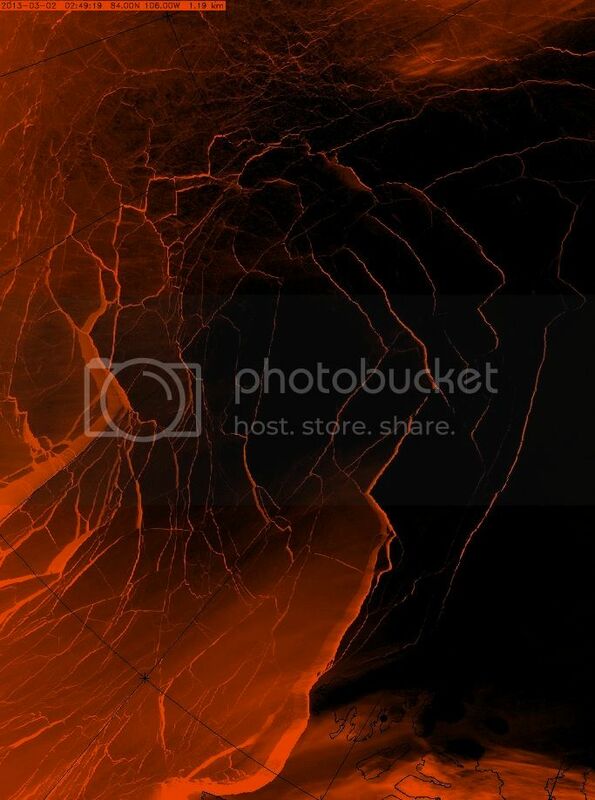 Do any of the other images which show cracks today have archives back to 2006? It would be interesting to go back and look at the lighter colored areas seen back then? Are we getting ahead of ourselves predicting dire consequences from never before seen cracks? I more or less 100% agree with your position. Especially when it comes to the intelligence test!! RunInCircles, I coincidentally noticed the same when updating the sea ice concentration maps. On the other hand, how trustworthy are these subtle concentration differences? I know that during summer no SIC image is the same as the one on the day before, colours shifting all over the place. And if in 2006 the ice was as thin/weak, we would've seen a more pronounced effect during the melting season. I do not think the ice was as thin but could it have been fractured with large leads? I've always wondered why 2005, 2006 winter showed such low concentration whilst the years since 2007 have much greater concentration. Could just be the sense technology has been upgraded since. In summer melt water ponds screw up the sensor retrievals. That's why you can get unfeasibly massive shifts in concentration in the middle of the pack. Other factors (snow?) could have a similar effect in winter. Rather than rehash, not all of us think these cracks mean a record melt. I have my own reasons for expecting that. Things fell apart out there this afternoon. This new pair of 550 km long fractures represents a significant eastward extension of the crack system through the core of the thickest, oldest, coldest, hardest ice of the CAA. It happened rather fast: nothing at 14:36 UTC, hairline cracks on the 16:16, both visible but barely at 17:51, both well-developed by 19:31. They'll be a several kilometers wide by the next satellite pass. I will catch it with an animation these evening in the off-chance that it will be seen in a few months as a historic tipping point. "Why do we want to know beforehand? "When the results of the experiment are in, the intelligence test lies in our reaction to those results." Knowledge for its own sake is sufficient. But it's more than that. It's awe in the face of an ominous and overpowering reality that is rapidly heading towards us. Do something about it? Yes, definitely. Not preventing it, of course, since the meltdown has already passed the tipping point but adapting to it. How? By securing our food production. It is crop failures, not merely property damage, that will affect us and the rest of the world. 1. Eliminate the production of biofuels from corn. That takes a large portion of our corn harvest. It is also a most inefficient use of natural gas from which fertilizer is derived from. 2. Food (grains) stockpiling on a federal and individual level. On an individual level a year's supply of wheat packaged in oxygen free containers (gallon size, 20 year shelf life). I realize that this will give the impression of being "survivalist" and that's right. It would be necessary to stabilize food prices. I didn't see that coming, it is quite opposite what I expected! This has been quite interesting. I haven't been able to get the time I normally spend on reading since December and this event is bigger, earlier than anything I've seen in the last decade. On the point of the models. As a long time observer of realclimate I like to remember Gavin Schmidt's stance against the statisticians who decided to take Michael Mann's hockey stick apart. When they finally came back and stated that there was so much noise that they could not apply a statistical model to it which could give a clear answer, Gavin replied. "You have to have somewhere to stand" People expect answers from them and they have to make a decision and produce results which can be backed up and proven. Prominent scientists are not so bothered about their reputation, more about giving the wrong answer and doing more damage than good. They recognise the fact that climate changes are out of step with the models, however that should be cause for MORE action, not less. Whilst they are wrong, they are also bound in a way this forum is not. We should recognise that. They cannot change their models to reflect the very rapid and unpredictable changes in the Arctic. That is the world of WUWT and it is how it should be. On another front, I noted the points in discussion but I missed one which I've been hearing a lot about in the Antarctic recently. Namely that the growing heat budget in the Antarctic is being blanketed by the winter ice and is undermining the ice shelves. We know the heat budget in the arctic sea is growing massively, we also know that the storm in late 2012 caused a strong mixing of waters and heat layers at the end of the season, heat which could have been trapped with the onset of winter. Could what we are seeing now be in part (only partially, I recognise), to do with the warmer seas undermining the winter ice pack and escaping back into the atmosphere? It might also be useful to hop over to realclimate and read Gavin's post on the 2012 Updates to model-observation comparisons. Sea ice changes this year were again very dramatic, with the Arctic September minimum destroying the previous records in all the data products. Updating the Stroeve et al. (2007)(pdf) analysis (courtesy of Marika Holland) using the NSIDC data we can see that the Arctic continues to melt faster than any of the AR4/CMIP3 models predicted. This is no longer so true for the CMIP5 models, but those comparisons will need to wait for another day (Stroeve et al, 2012). Thanks for posting the above. After commenting about the possibility of MYI fractures this morning, I went to work wondering if my supposition would be borne out. It seemed to me that the pressures on the ice, and given that it is not all consistently thick, would allow a good probability that these fractures would appear. With these new lines/fractures, I further suspect more will appear, and that what is present will widen. If the rest breaks down, we may witness a moving pack through the melting season, dependent on wind and currents. One further suspicion is that more of the MYI will be farther from the NP through the melt season. I think an ice free 90 N is becoming more possible this year. I will post another marked AVHRR copy on the Forum. I hope you do not mind, A-team, but I am saving a copy of your image above for marking/preserving history. While the implications of this fracturing will only be apparent in the melt, it has made for an exciting winter. Here is the last 60 days of color radar from Japan. I marked up the last frame as a stationary jpg that points out things to watch. Two main things are going on: accelerating export of old ice out the Fram the last few days, and rotating of old ice in the east Beaufort out into the summer melt zone. This thick ice is like cold cookie dough -- it stretches if pulled slowly but breaks if too fast. Right now it is being pulled too hard at one end and rotated into the melt zone at the other. If a few more days of this are in store -- which seems to be the case -- between melting and export, a lot of this thick ice is effectively toast. Everything here is open source, no permissions or crediting needed, feel to redistribute as you see fit. M.Owens, it will certainly be a bad year. I have increased the chance to have the North Pole ice free from 60 to 70%. All the recent anomaly examples are dizzying to follow, totally unreal for a near 30 year observer of of sea ice. Along with blizzards at 1035 mb pressure and Greenland having 1070 mb SLP anticyclone hanging over it. The high at 1057 mb over the SW North American Quadrant of the North Pole is also literally making an impression of itself on the ice surface. ...looks ludicrously conservative to me. Hi folks, finally the dawn of a new promising spring is upon us, and signs of doom is looming at every corner! Well we better grit our teeth and try to be convinced that our words and oppinions DO matter, in the long run, right!? What differences will this lead to, and of how much greater importance is the ice export out the Fram strait, compared?! You guys have kept up a formidable speed and level during the winter season, its darn hard just to dig in. Also a big salute to A-team, you`ve brought a truly new dimension into this blog. New sea ice cracks entering from North of Ellesmere Island towards west, actually from where I expected cracks to come from earlier. Here is something a little different. It turns out that the near-infrared avhrr imagery (3.74µ channel 3) is good for something after all. It arrives looking very pixellated (lower resolution than 10.8µ channel 4). While 'despeckle' in Gimp or PS can fix the esthetics, that won't add information about the ice. It may also be affected by increasing Arctic daylight, though not as dramatically as the 0.92µ channel 2. At any rate, I looked at pictures from time to time but wasn't systematically archiving it. Today I noticed that it actually does a better job of detecting new fractures earlier than the higher resolution imagery. I think the explanation is that when a fracture occurs, it exposes relatively warm ocean water to much colder air up to freeze-over (which might be several days if the crack is widening). Especially on a windy day, water vapor comes off and freezes as a downwind plume cloud, emitting heat at wavelengths (near-infrared) peaked favorably with respect to capabilities of the 3.74µ sensor on the NOAA satellite. So it sees the plume when the main channel cannot, effectively magnifying fracture width. Cracks need to grow to ~1000 m wide before they show up at the 10.8µ wavelength. It's also a matter of sensor contrast relative to cold (white) CAA ice. Getting 8 hours ahead of the curve is not terribly important if the key metric here is annual Arctic Ocean heat budget change (rather than Sept volume or extent minimum) but it does give useful real-time clues to surface winds, ice condition and fracture refreeze status without having to put somebody down on the ice, all over the ice. Overall, let's not become complacent with animation pipelines because image interpretation changes to a moving target once melt season begins. Visible becomes more important while radar more or less drops out. For small regions, such as Nares Strait and Petermann glacier, speciality archives for high resolution Modis visible and near-infrared are very convenient; for algal blooms, the longer wavelength channels, etc. 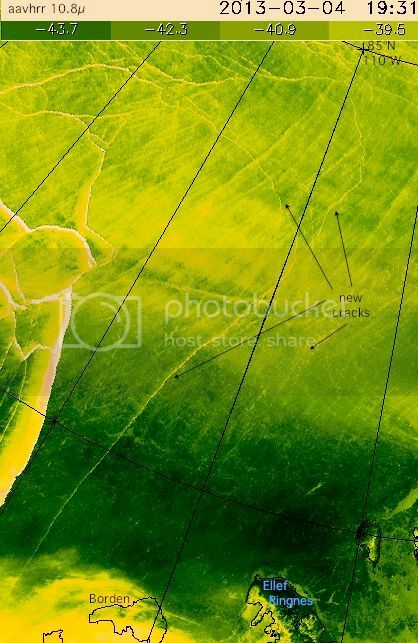 The simultaneous images below are just straight crops of three channel pngs for the date stamp shown, not enhanced in any way (managed to restrain myself from a triple animation). You are working magics these days. I sometimes wondered whether you really are a team with various competences. Please keep up the good work!